When I turned 18, I talked about how I was comfortable living in my box. I quoted, in my opinion, one of the most cliche sayings: "Life begins at the end of your comfort zone." I'm sure we've all pinned something that shares the same sentiment at least once because I know I have. At 18 I still didn't take risks even though I wanted to say I did. I think everyone wants to say they would be willing to do something that scares them, and I knew I would be happier if I had the courage to take a risk. Try something new and maybe even fail, but I didn't. If I took a risk in high school, it was completely calculated, and I likely knew the outcome before it even happened. However, that had to change once I got to college. One of the things college has forced me do is abandon my box without knowing exactly what would happen next. Leave my comfort zone and not know what was on the outside. I mean sorority recruitment was one big experience that made me face a lot of anxieties, and even joining a sorority made me face a lot of anxieties. I was no longer surrounded by people I knew, and there was no sense of comfort in anything I did for a while. I wandered around in the dark for the longest time. But for most of my first semester, I didn't try anything new or do anything where I thought I could fail. In the first month of school, I joined one club and applied for one thing, which I didn't get. I was scared of failing, something I had never done before. I didn't fail in high school, and I was not about to start failing in college. This was not exactly the right mentality I needed to have, especially in a place where I had to be willingly to try something, anything, new. In October, I met with my Theta mentor, and I asked her how I could get more involved with my major and in the house because after two months I finally realized that I was just not doing anything. I was tired of not having my "thing." She told me about two things that changed my freshman year for the better - PRSSA and my house's media committee. Now this was nothing too big or risky, but for me, it was the step in the right direction, which is sometimes the most important thing. I wasn't stuck on square one anymore. Fast forward to this semester. One of my goals for the new year was to take more risks and be more willing to fail. I decided to get more easily involved in the house, so I would feel better about applying for positions in the fall. The first thing I did was accept a nomination for a position, which I ended up getting, and I joined another committee within the house. However, as much as I love Theta, I knew I needed to start looking for opportunities outside of the house because my sorority can't define everything I do. This leads me to where I am now. Two weeks ago I had interviews for two different positions. Needless to say, I was scared out of my mind. I hate interviews. I am flat out terrible at them, so naturally, I spent the entire week on edge, and I was a bundle of nerves the entire time. There were times during that week where I honestly regretted putting myself through the stress of interviews and waiting. I am impatient, and I just wanted to know immediately whether or not I was going to get these positions. On that Friday morning I found out I didn't get one, which was a horrible feeling, and I could have promised you that I wasn't going to get the other one. But I did. While I had gotten a rejection notice that morning, I got an acceptance notice that afternoon for the position I really wanted. Like I said, I didn't think I was going to get it because I am a freshman, and on paper, I am pretty much unqualified to do anything. But I took a risk. I applied for it because I wanted it, not because I knew I could get it. Now I am getting to do something super exciting this summer with the College of Communication, and I never would have this opportunity if I hadn't been willing to take a risk. This last weekend I went to a women's lifestyle and leadership conference at Alabama, and I went to a panel where three amazing women - students at Alabama - spoke. At the beginning of the panel, I was listening to them talk about their accomplishments, and I was amazed at all the work they had done in three or four years. At the end, though, one of the women reminded us that yeah, all three of them had a long list of accomplishments, but they also had a list of rejections. They didn't get everything they applied for. I think that's something that's super important to remember. You usually only see someone's successes and never their failures, but they're still there. 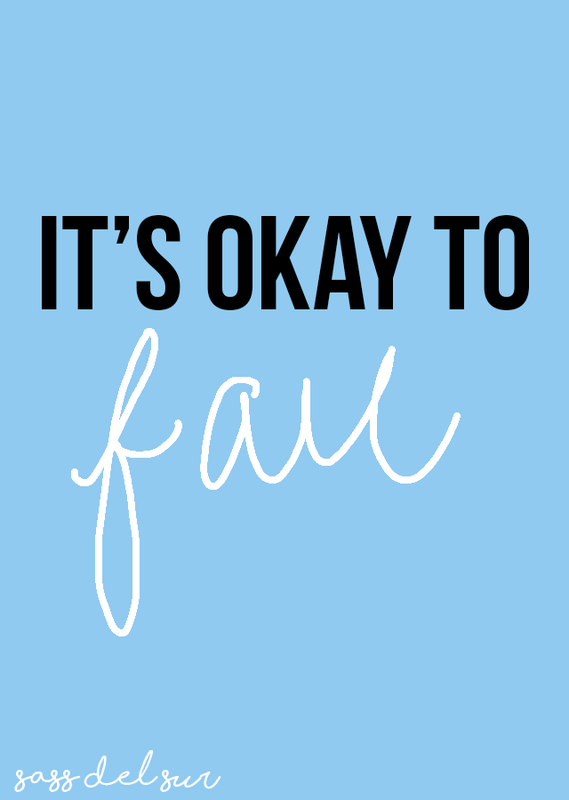 Failures are always going to happen, but what's important is how you handle your failures and what your next step is going to be after you fail.